The founders of Kata Bags created their first designs from extensive service in Elite Special Forces and the company has now grown into a quality manufacture who sells their wares in over 100 countries worldwide. Kata has a range that stretch from a belt pack to full blow video camera bags and harnesses. They have a reputation for quality and innovation. The Bumblebee UL 222 that we tested will take up to a 17″ Laptop along with a Pro DSLR with a 70 – 200mm lens attached and four lenses along with the normal filters etc you would need and is also available in other sizes as required. Firstly it should be said that this bag is incredible to look at and appreciate. I nearly hyper ventilated when I first unveiled it from its box and basked in it’s silvery gorgeousness. 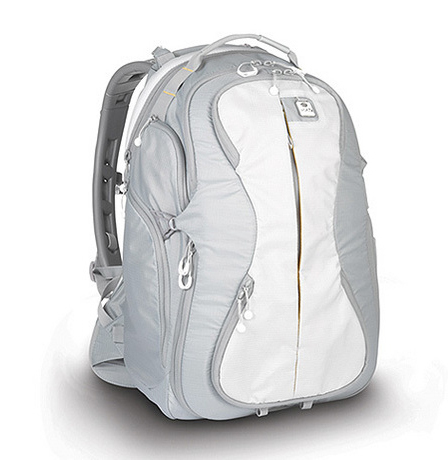 This bag is nirvana for gadget heads. There are so many loops, attachments, buckles and zips you could happily spend an entire day poking around into it’s hidden parts. All the gadgets inside this item screams of quality and innovation. One of the highlights being the aluminum support system which distributes the weight effectively and keeps the bag away from your back preventing unsightly sweaty patches. I can safely say this is the first bag I have ever used camera or otherwise that doesn’t make your top ride up during hiking. 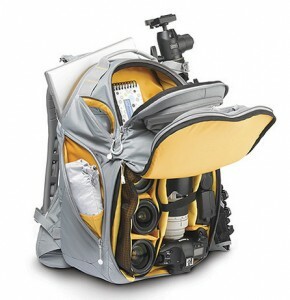 This bag would be an excellent choice for travel due to the assorted pockets and storage spaces it contains. The top half of the bag is great for storing your mid day snack or anything else you care to carry whilst there are enough pockets on the outer to pack most of your day tripping items. looking pretty for. After a couple of weeks of our testing on hikes and day trips the bag was starting to look decidley grubby so if I were buying I would probably opt for the black version. This would also cut down on the chances of getting mugged as if you were going to get robbed for a bag it would be this one as it screams look at me I’m full of expensive goodies. Not so much of a problem in Europe or America but I think if I were exploring the back streets of Rio I would feel I had a target on my back. In summary this is a superb piece of equipment that has ample padding to keep your precious gadgets safe. I never worried about the safety of my gear whilst contained within this bag as there is a good half inch of padding at the thinnest point. We was also hugely impressed with the practicality and thought that has gone into the design even down to the excellent rain cover and removable camera section.